Quiet Publications – Theology for modern Christians living their faith. We’re back! 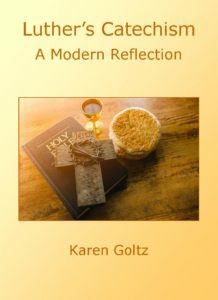 Quiet Publications has recently published its first book, Luther’s Catechism: A Modern Reflection by Karen Goltz. You can order it on our Books page and pay by check, or order it online on Ebay or at Harvard Bookstore and pay by credit card. We’ve also brought back our daily devotional blog, Quiet Devotions. Want to start your day with a brief reflection on one of the readings from the daily lectionary? Enter your e-mail address in the sidebar so you never miss an entry. In the meantime, this website is in the process of being redesigned. If you happen to stop by during the construction process, please be patient. Thank you for your understanding.